Most of these collages are available for sale, priced from $100 to $400. 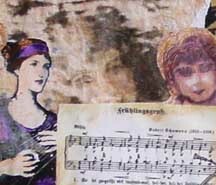 Scroll down to see larger images and brief descriptions of these collages. This 16"x20" collage has 30 cut and torn-paper crosses arranged in a quilt-like pattern. The crosses are similar to the ones I used when I made the thank you cards following the death of our son. This 16"x20" three-dimensional paper sculpture collage comes in a natural wood frame, ready for hanging. Everything is white except for a very thin line of gold on the diagonal sides of the cut-out triangles. This cut paper collage uses liturgical colors to fill the square spaces formed when the four small crosses are placed around a central cross. 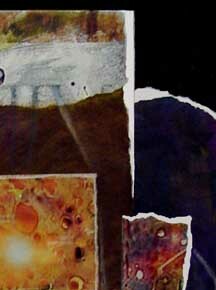 This 16"x20" collage features wonderful textures in the variety of turpentine papers used. The black "void" is a perfect foil for the luminous colors. Note the thin black line that completes the rectangle of black below the turpentine papers. 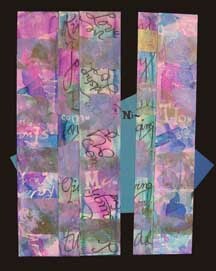 This 16"x20" collage on a stretched canvas is made of strips of painted, stamped and written- upon watercolor paper. 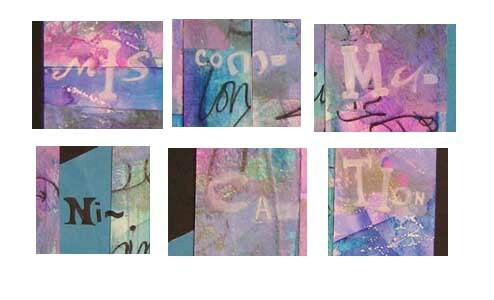 The syllables of "miscommunication" are almost hidden, as can be seen in the detail shot above. Behind the two rectangular pieces are two blue papers positioned to form a polygon. Another possible name for this collage would be Towers of Babel. 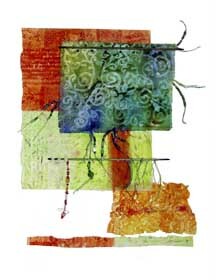 This collage has stamped and hand-dyed cloth, papers with gesso and stamping, beads, and small dowels, all in an assymetrical but stable balance. It measures 16"x20", and is barely three-dimensional. It comes in a light wood shadowbox frame. 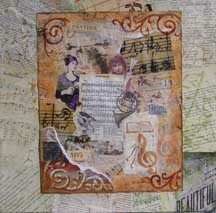 This 10"x10" collage on canvas includes a mix of papers, stamping, Prismacolors and transfers. The image is bordered with pages from an encyclopedia, a German dictionary, a German song, and other papers. 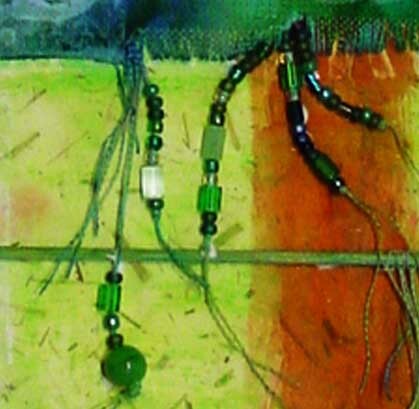 They wrap around the canvas, so this collage could be hung without a frame.